A few weeks ago, standing in line for grilled cheesy goodness, a coworker/friend and I started chatting up another coworker and giving our sandwich recommendations. He liked what we suggested, and thus, a foodie friendship was born. Our trio decided to start lunching monthly at places outside the confines of our office park, away from chain restaurants and the office cafeteria. I was given the task of choosing the location for our first outing, After whittling down a list that started with about 17 spots, I finally settled on somewhere I'd always wanted to go but had never been: Gabby's Burgers and Fries. Tucked away on Humphreys St. behind the Nashville Sounds' Greer Stadium, Gabby's is not hard to find if you know what you're looking for; the street pretty much dead-ends into the front door. Looking like not much more than a glorified trailer, it's the type of place that you can tell from the outside will be darn good. And that was pretty much Brian's initial reaction when we pulled up. Inside, it's a no-frills kind of place, with counter seating in front of the grill and tables squeezed in everywhere else. I recommend arriving early. We were there by 11:30 and didn't have to wait too long, but the line was out the door by the time we were leaving. The line moves quickly, though, and you better know what you want because they don't allow for much dilly-dallying and indecisiveness once you make it to the register. In a hurry, I ordered a classic cheeseburger, named The Seamus for the owner's son. I fancied up the single 5oz. patty by topping it with bleu cheese and grilled onions and opted for sweet potato fries as my side. Patti opted for the barbecue burger, and Brian chose to be adventurous with the monthly special, The Politician, a tongue-in-cheek name for an American cheeseburger topped with grilled bologna. 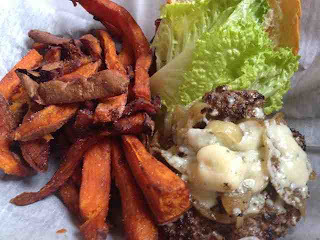 Using only grass-fed beef, Gabby's prides itself on quality of food and quality of service. The meat itself was so good that the toppings served to enhance the flavor, not cover it up. The produce was fresh and the buns were the perfect vessel for conveying meat from plate to mouth. Not too dense to feel as though all you were eating was bread but flavorful enough to be noticed, and slightly sweet. Perfection! I opted for sweet potato fries, mostly out of curiosity. This trend is becoming ubiquitous and not every shop does it right. But Gabby's certainly does. They used fresh sweet potatos, diced and cooked on site. They tasted almost candied--no frozen Ore-Ida nonsense here! The menu features other non-burger items as well, but why would you want to go there? All the sandwiches are reasonably priced for the quality of food being served. What makes me love Gabby's even more after the fact is the story of how this little place got started. When studying their website for this post, I learned that the proprietor, Doug, has a passion for food, which is evident from the first bite of burger. But more so than that, Doug has a passion for his family and for finding a way to "live the dream" as he says. That dream is to make money at a job he loves, make people happy doing it, and be able to spend time watching his kids grow up. I think this man's on to something! I will certainly return to help Doug's dreams come true. As we were wrapping up our lunch, I heard Doug shout over the heads of all the hungry customers waiting in line: "Thank you, folks, for being willing to stand in line for a good burger." I had friends in town who had braved the elements to complete the half-marathon on Saturday. To celebrate their accomplishments and help them explore the city, we decided to brunch on Sunday before they left town. As I have mentioned at least five times before in this space, I love brunch. It's easily my favorite meal of the day. For this brunching occasion, we ventured outside my usual repertoire and visited Marché in the Five Points area of East Nashville. Although we arrived at 10:30, which I would consider on the earlier side of the brunch hour, we had to wait for nearly 45 minutes to be seated. This proved to not be that problematic, as the staff at Marché allows you to purchase a bottle of bubbly to sip on while you wait! Forget diluting the sparkling wine with OJ for a mimosa, we went straight for the Prosecco. The runners deserved it, and I just needed to support them, right? Waiting also gave us the opportunity to watch and smell every delectable dish that was brought out of the kitchen. Between the French pastries and the locally sourced bacon and eggs, it was going to be hard to make a decision! When we sat down at the cozy table, we were ready to make our decisions. Although the five of us crowded around the small table was a little tight, we were just relieved to be sitting. We were able to bring our opened bottle of bubbly to the table with us. Our waiter was great--he had such a fun personality, which is sometimes rare when a restaurant is busy. I opted for a strata of andouille sausage, onions, peppers, and cheddar cheese. The strata was denser than I expected and the meat and veggies were chopped finely, in order to taste all of it in every bite. I ordered a side of roasted red potatoes to supplement the strata and the side of greens served with each entree, making for a colorful and wonderful meal. The jewel of everyone else's meal was the brûléed grapefruit. Not being a grapefruit fan, I didn't order any, but I have to admit that the caramelized, sugary coating did make for a beautiful and enticing piece of fruit. Though the wait was long, it was worth it. The food was fresh, locally sourced, and quite good. Don't try to brunch at Marché if you are in a rush or need to catch an airplane. But if you have time to slow down, sit, and savor your food, set your sights on Marché. And if the wait gets too long, you can always go to the counter and buy a croissant and a bottle of champagne to tide you over. Talk about an affordable luxury! You'll feel like a little piece of a French bistro has fallen right into the middle of East Nashville.